The top selling lot of the three-day sale was a marine scene by Russian artist Ivan Konstantinova Aivazovsky. Signed in Cyrillic, dated 1853 and titled “Sunset in Crimea,” it depicted two fully rigged sailing ships becalmed in a harbor. 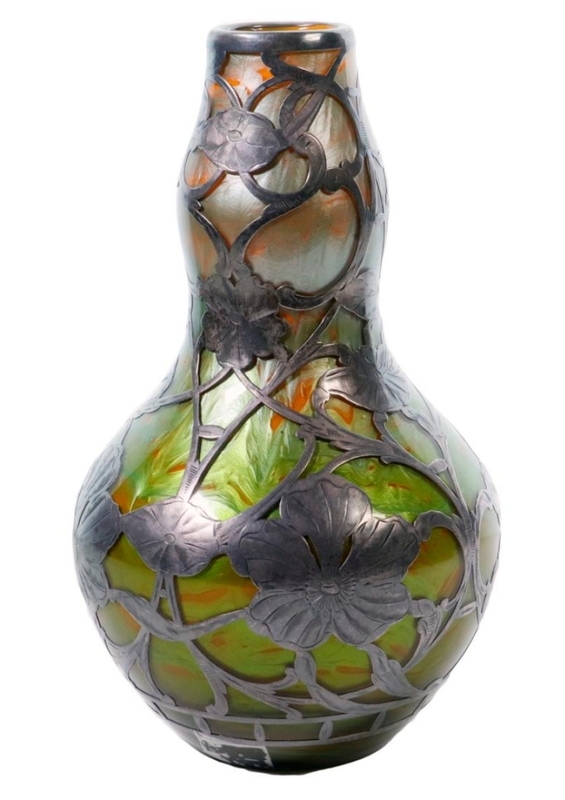 It sold for $128,700 and is on its way back to Russia. 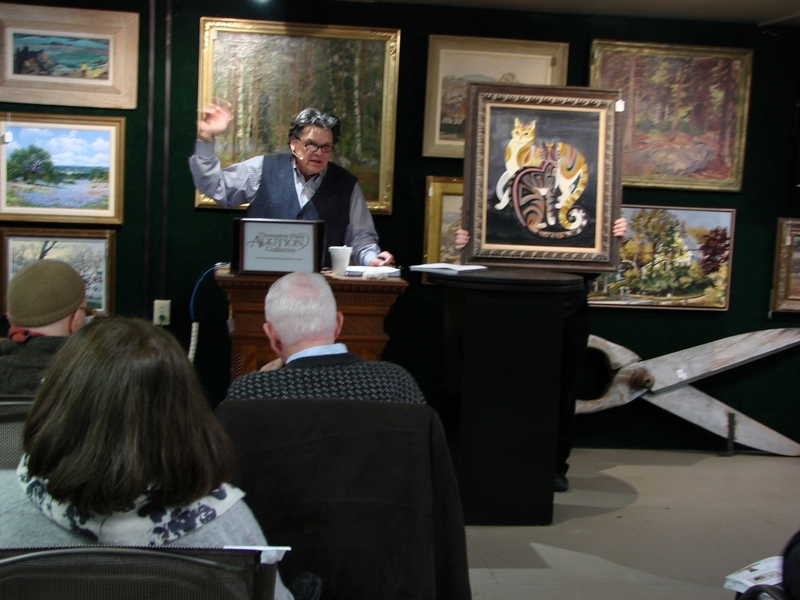 THOMASTON, MAINE – The Winter Weekend Auction at Kaja Veilleux’s Thomaston Place Auction Galleries, March 1-3, grossed about $1.5 million with strong results in several categories. 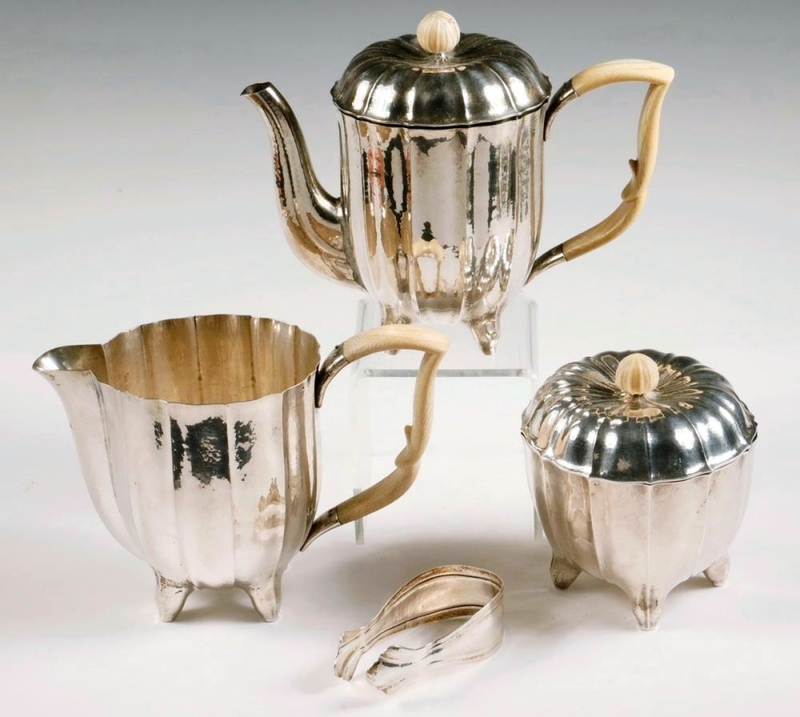 European, American and Asian paintings and etchings did well; American furniture did better than one might expect; Asian material also performed; as did silver and jewelry. A first edition of The Adventures of Huckleberry Finn with fore-edge painting led a full day of books and ephemera. Numerous items brought more than $10,000; internet bidding on three platforms was busy, as were phone lines and absentee bids. 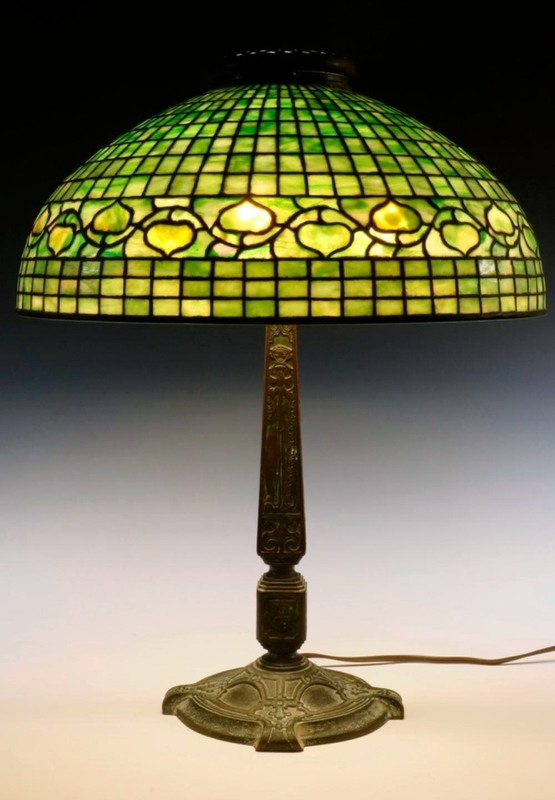 The 1,200 lots sold also included an exceptional hooked rug, two Tiffany lamps, a rare piece of Loetz, scrimshaw, scientific instruments and more. 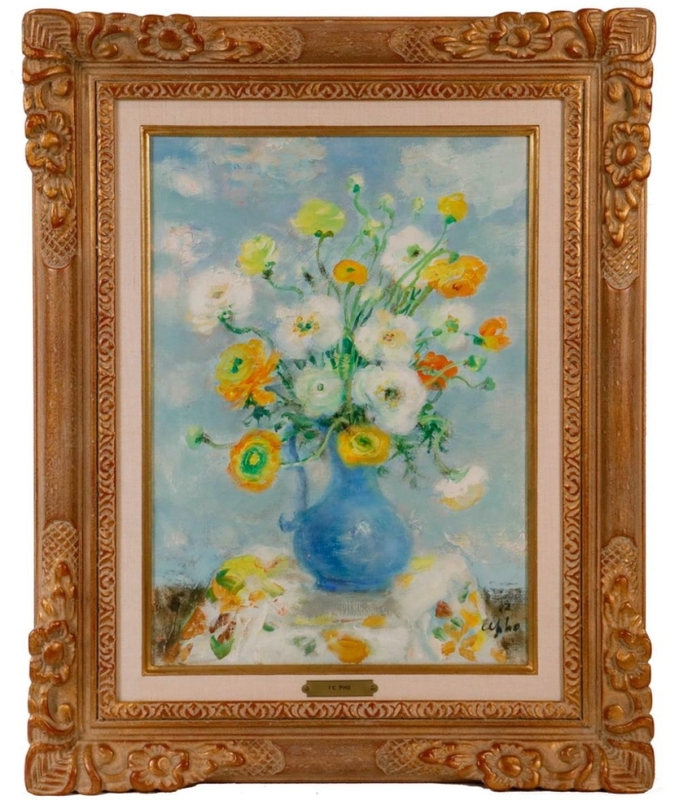 The top lot of the three-day sale, reaching $128,700, was a painting by a Russian artist, which is on its way back to Russia. A large marine oil painting by Ivan Konstantinova Aivazovsky (1817-1900) was signed in Cyrillic and dated 1853. 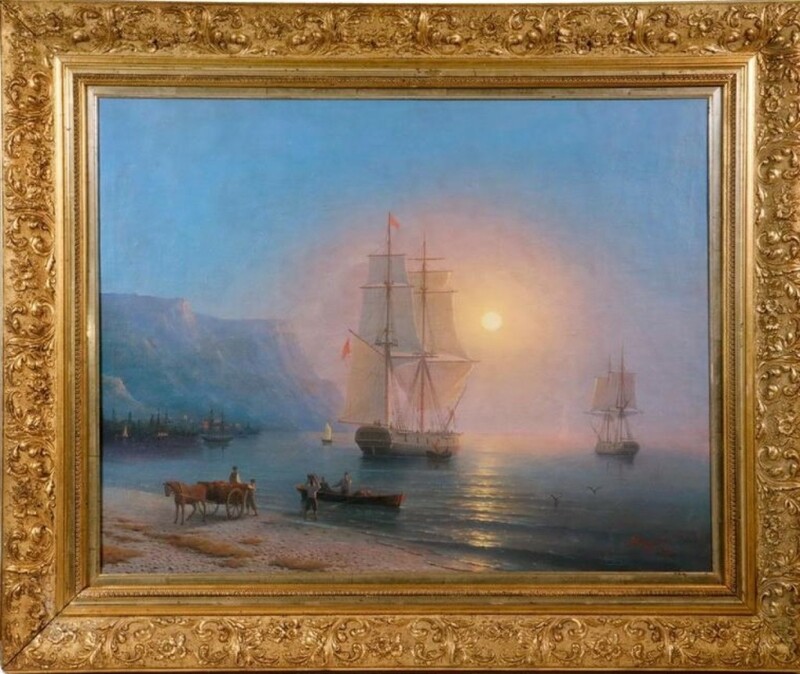 Titled “Sunset in Crimea,” it depicted two fully rigged sailing ships becalmed in a harbor, the unloading of freight being assisted by men and horse-drawn wagons on the shore. The 1853 date places it early in the Crimean War, which lasted 1853-56. The artist was prolific, traveling throughout Russia and the Ukraine, but his paintings do not often turn up in the United States. 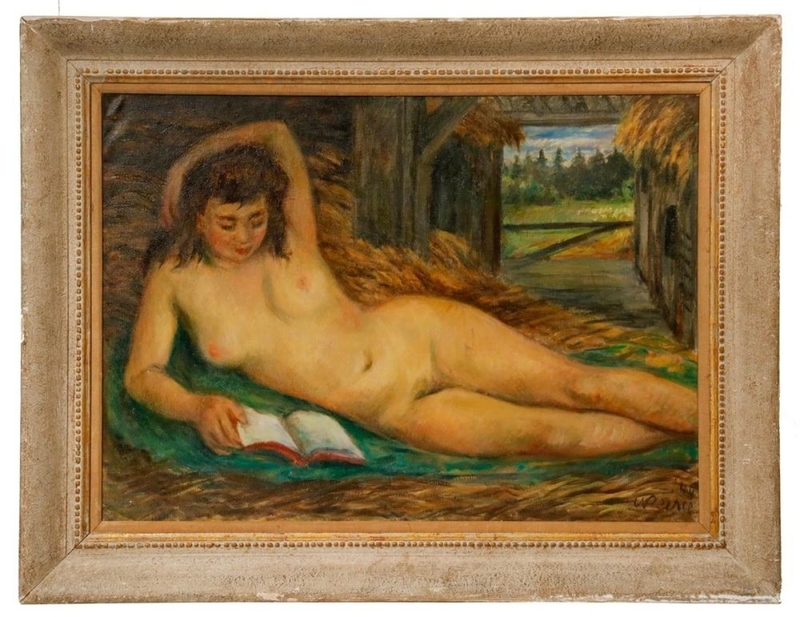 A painting by Vietnamese artist Le Pho (1907-2001) did well, bringing $18,720. It depicted flowers in a blue vase and was signed and dated “’39.” He studied in Hanoi and later in Paris, where he spent most of his life. 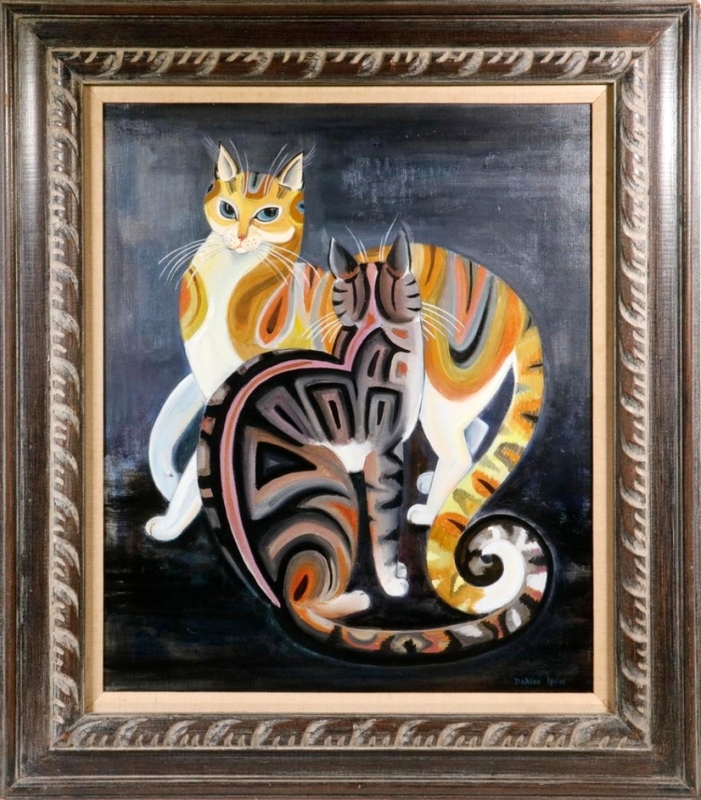 Apparently setting a new auction record for a painting by Dahlov Ipcar (1907-2017), at $21,060, was “Encounter,” signed and dated 1967, depicting two cats at play. 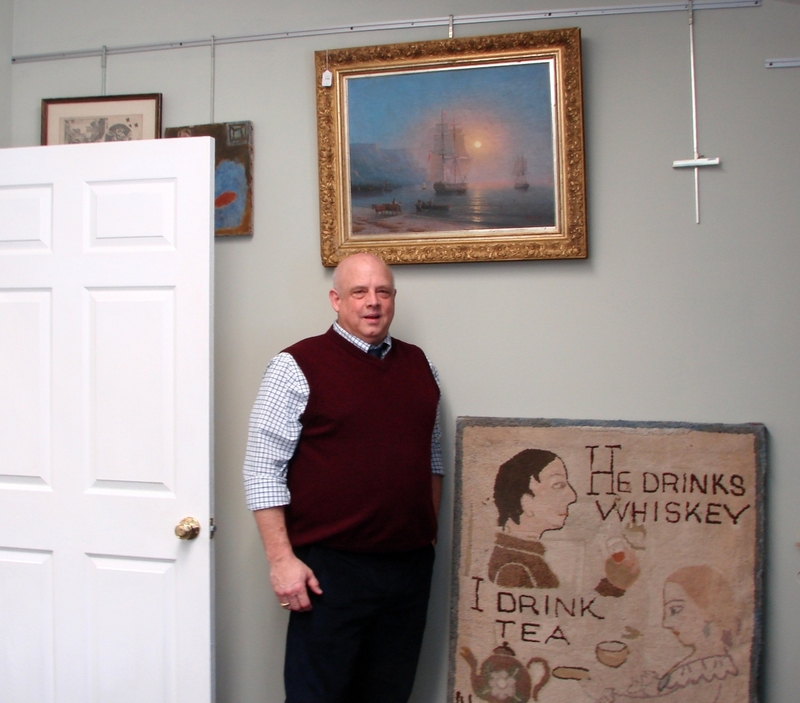 It may have been purchased at an art fair in Rockland, Maine, in 1974, and it had a price label attached, indicating that its original price was $750. 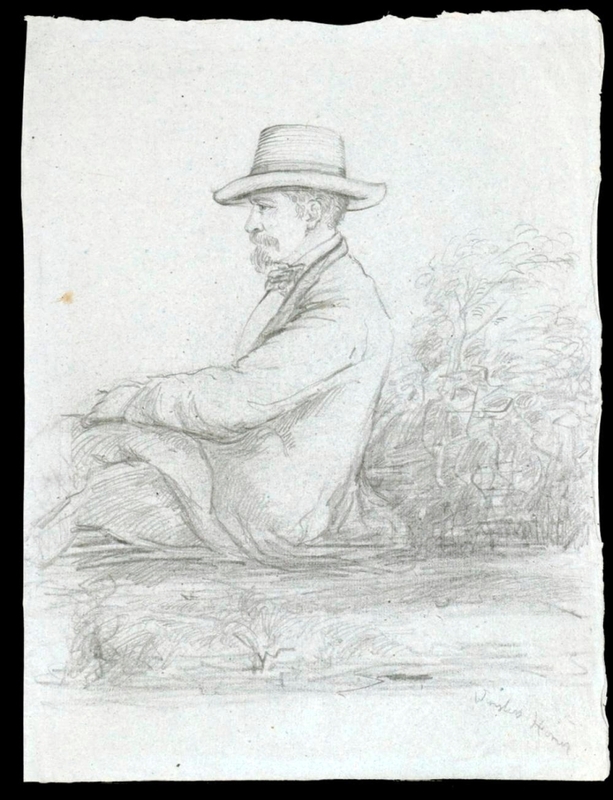 A graphite drawing by Winslow Homer (1836-1910), “Portrait of John Murray Brown” (of Boston publishers Little, Brown & Little), fetched $21,060. An oil on canvas marine view by Elisha Taylor Baker (1827-1890), signed and dated 1882, depicted an unidentified sail/steam vessel, being towed by a tug boat with numerous pleasure craft in the background. 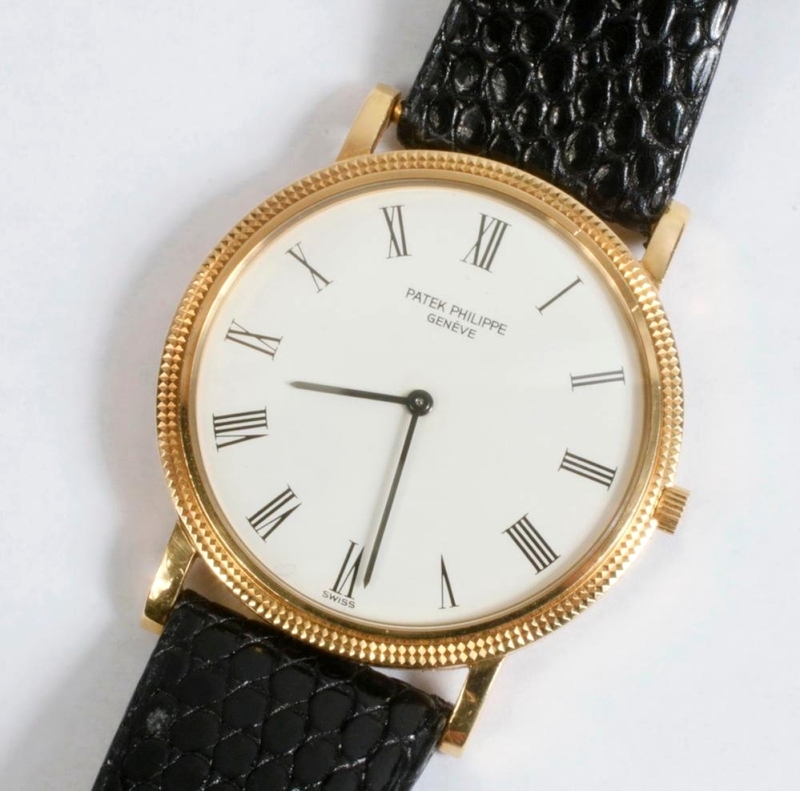 It sold for $5,850. There were four works by members of the Wyeth family. 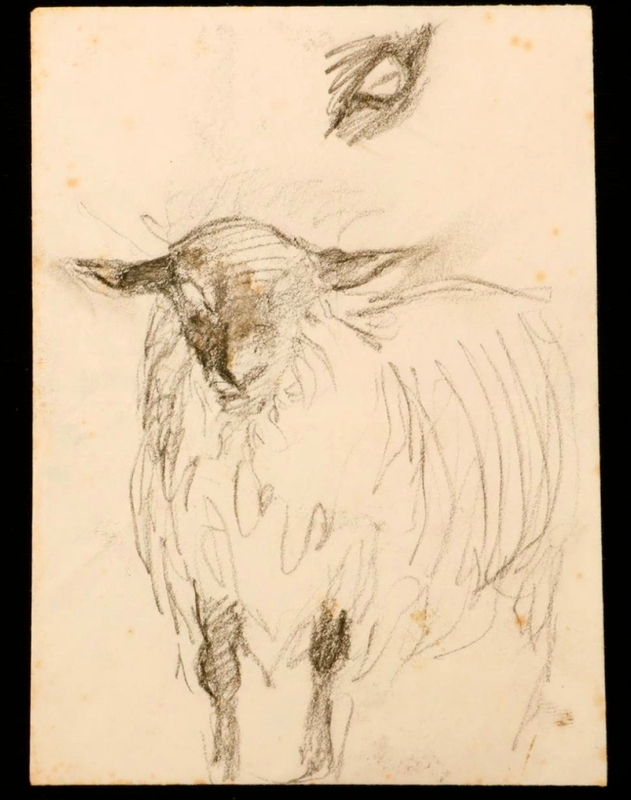 An unsigned charcoal study for “Portrait of a Lady,” depicting a black-faced sheep, circa 1969, done on the back of an envelope, realized $995. Most auctioneers will agree that estimating the value of Asian ceramics and art is a difficult job. It was demonstrated once again as a pair of Nineteenth Century Chinese Qing dynasty blue and white porcelain low bowls, with a Daoguang (1821–50) seal mark, sold for $23,400, many times the estimate. Each had figural and landscape decoration inside and out. 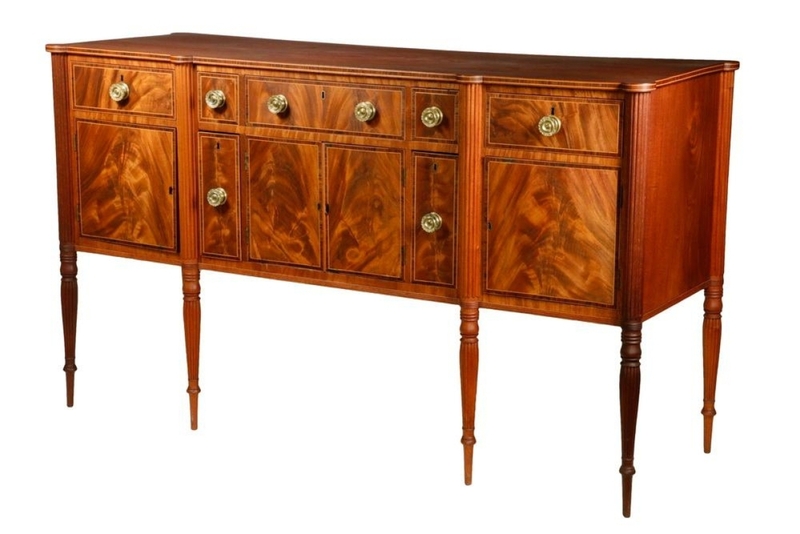 Some of the American furniture in the sale drew strong interest, particularly a mahogany Sheraton sideboard attributed to John and Thomas Seymour, which brought $14,040. 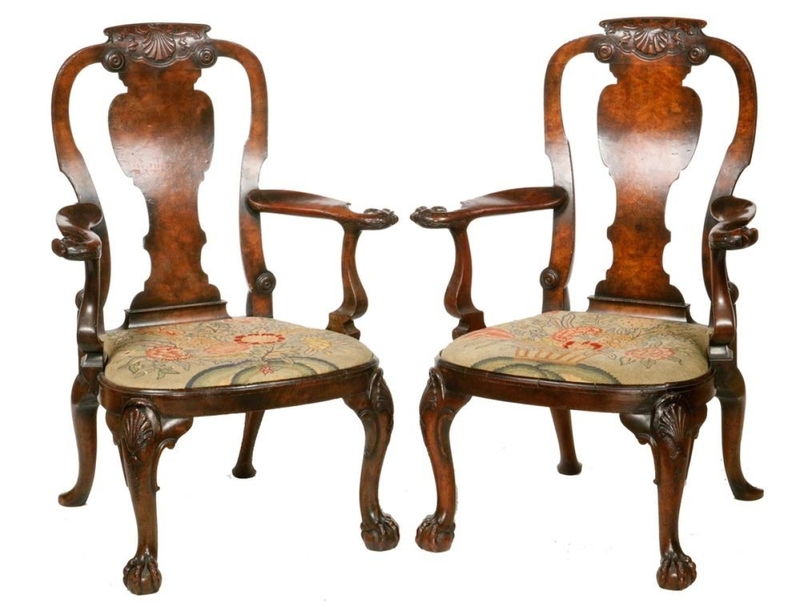 From the same Rockport, Maine, estate came a pair of Queen Anne carved mahogany lyre back armchairs, circa 1690-1720. Each had shell-carved crests with shaped arms ending in eagle heads. The balloon-shaped slip seats still had their original petit point fabric, and the pair brought $11,115. 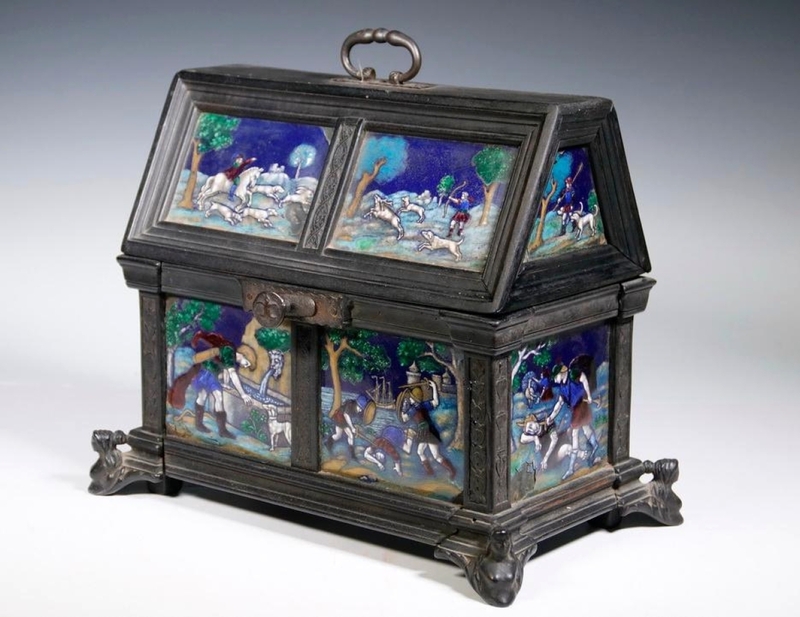 An Eighteenth Century Pennsylvania six-plank chest with floral panels and a mounted horseman flanked by a pair of unicorns on the lid, with original hardware, earned $4,680. A hooked rug with unusual subject matter was one of the folk art offerings. 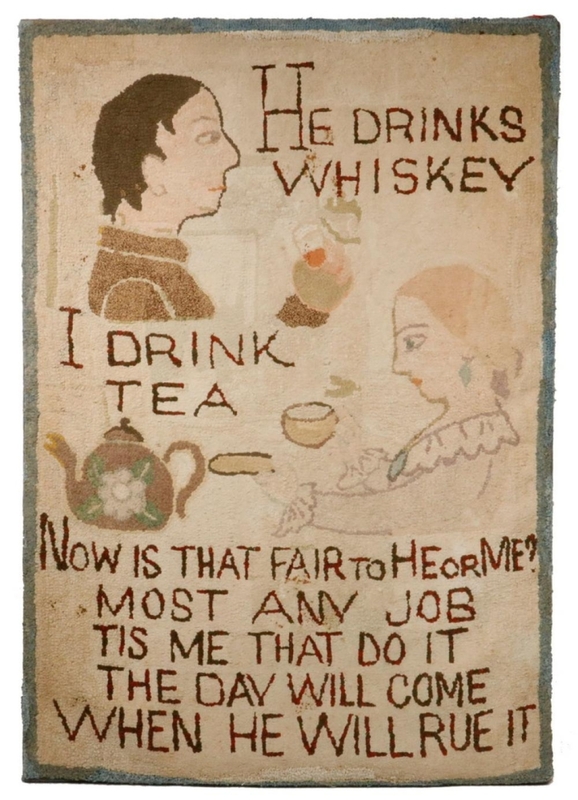 A circa 1930s rug with a temperance theme by James and Mercedes Hutchinson included bust portraits of a man and a woman and the wording “He drinks whiskey, I drink tea, Now is that fair to he or me? Most any job tis me who do it. The day will come when he will rue it.” The rug sold for $8,190. Two trade signs were also popular. One, in the form of a large pair of carved pine sailmaker’s shears, 74 inches wide, reached $3,218. There was also a 26-inch-tall glass Heinz ketchup display bottle. The interior was painted red, of course; it had a screw top and a paper label in the form of a keystone. Heinz archives date the piece to 1905-10 and it earned $585. Thomaston continues to turn up worthwhile Asian items. 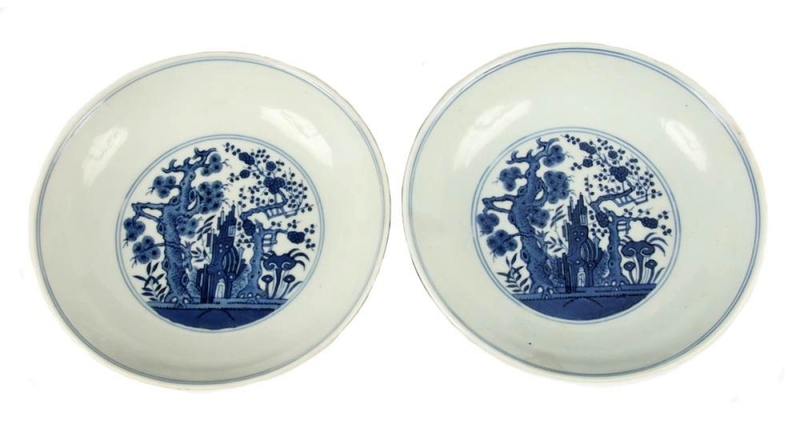 In this sale, a pair of Nineteenth Century Chinese Qing dynasty blue and white porcelain low bowls with Daoguang (1821-1850) seal marks realized $23,400. Each had figural and landscape decoration inside and out. 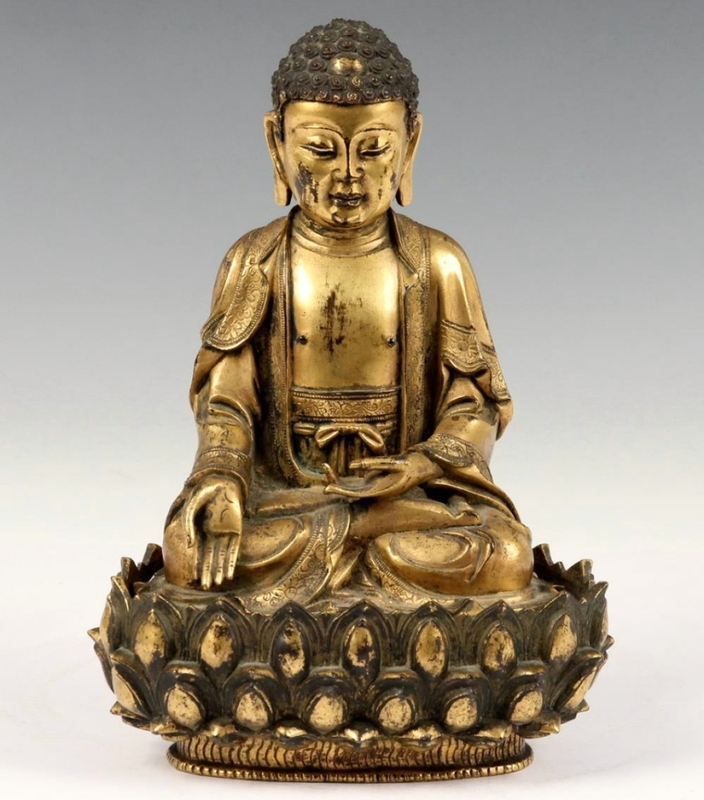 A Ming dynasty gilded-bronze figure of a seated Shakyamuni Buddha on a separate bronze lotus form base, 9¼ inches tall, went out for $21,060. Among other items bringing more than $10,000 was a red lacquered, carved seated Guanyin figure on a lotus platform above a multitiered stand that brought $12,870 and a 12-by-18-foot West Anatolian Ushak carpet that sold for $21,060, more than three times its estimate. The sale included a number of interesting smalls. 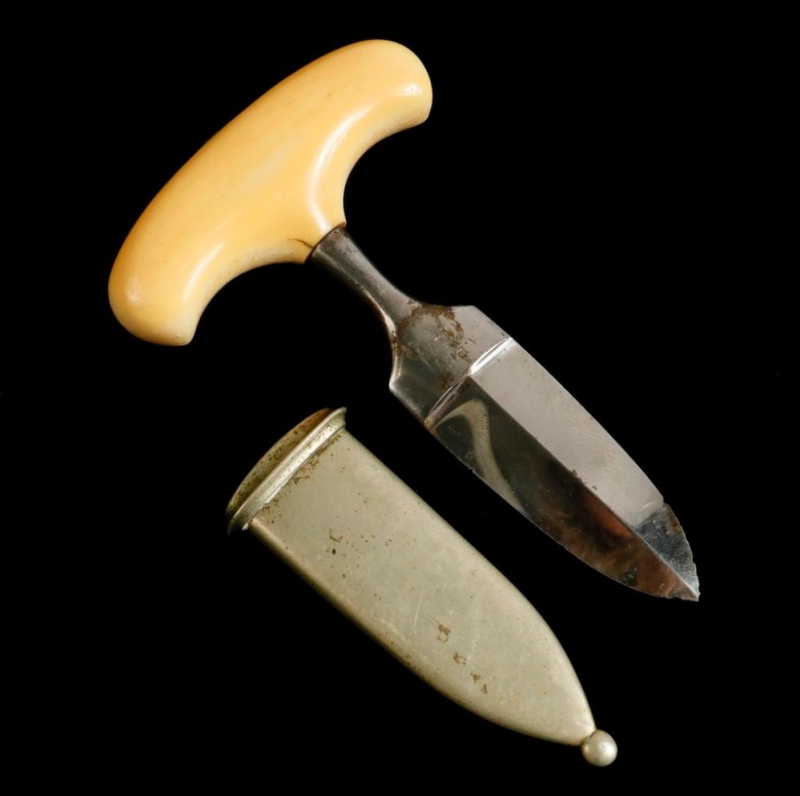 A Michael Price Gold Rush-era gamblers “push” dagger earned $12,870. 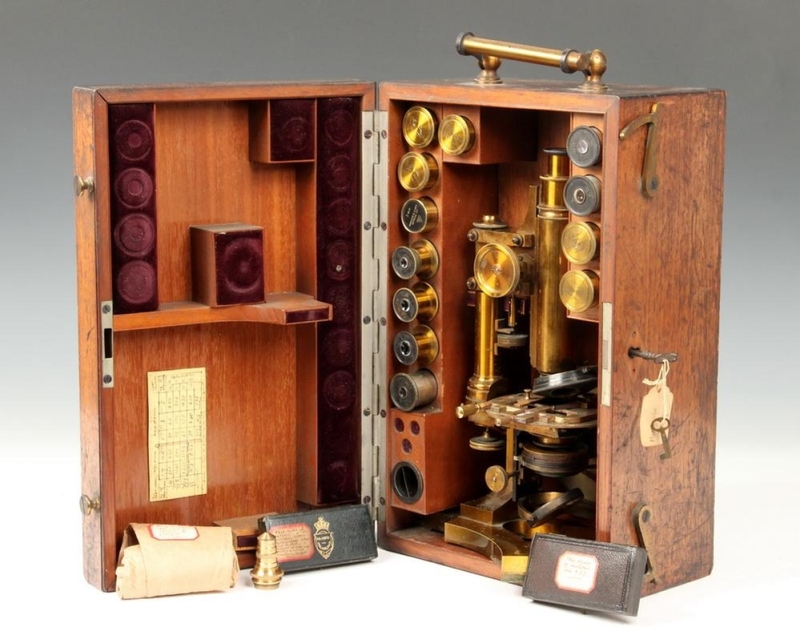 A Ninetieth Century Siebert microscope from the collection of a Harvard Museum curator went for $5,265. The circa 1890 cased instrument included 16 additional lenses and other accessories. The next lot, a matching mahogany slide case with numerous drawers included more than 400 slides, mostly of diatoms. It sold to the same buyer for $3,510. 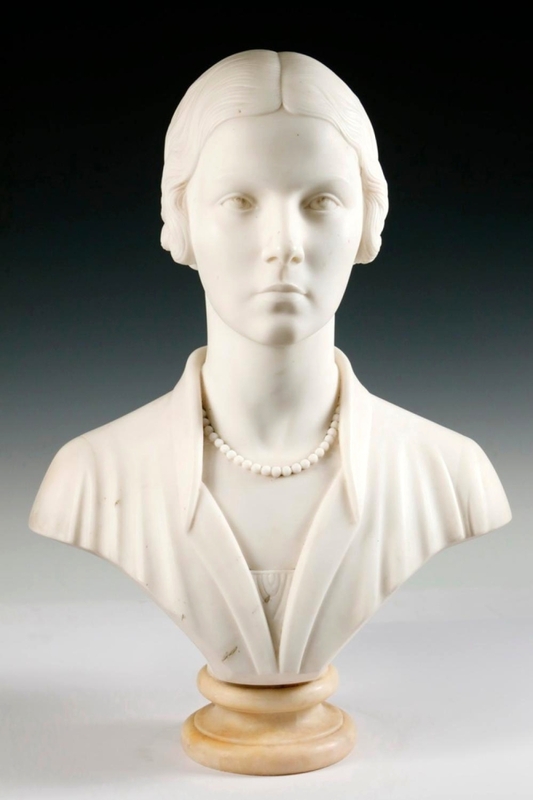 A 1928 carved white marble bust of Mrs Frederick Moseley Jr by Paul Manship, signed and dated and included in Manship’s catalogue raisonné, reached $9,360. 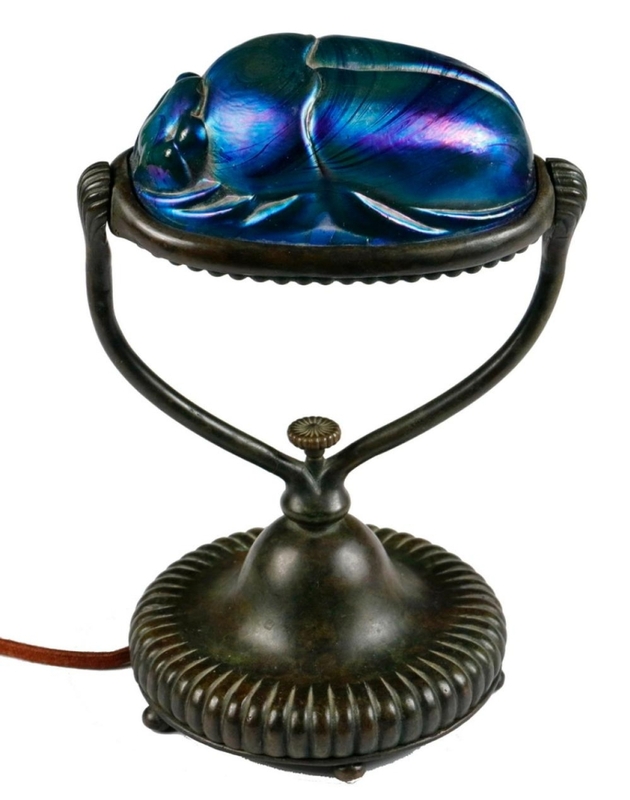 Prices given include the buyer’s premium as stated by the auction house. For additional information, www.thomastonauction.com or 207-354-8141. Good furniture brought good prices. From a Rockport, Maine, estate, a particularly nice mahogany Sheraton sideboard attributed to John and Thomas Seymour was bid to $14,040.